Surface Penetrating Radar is the use of usually a 1GHz antenna to scan within concrete structures to locate and mark the position of metal reinforcing or conduits. The 1 GHz antenna has such a high resolution picture it can easily pin point something as small as a household telephone wire under 6 to 8 inches of concrete. Above is a picture of the USRADAR 1GHz antenna used by Worksmart, Inc to pinpoint structure in concrete. Below is an actual scan of a concrete floor performed in advance of a coring operation. 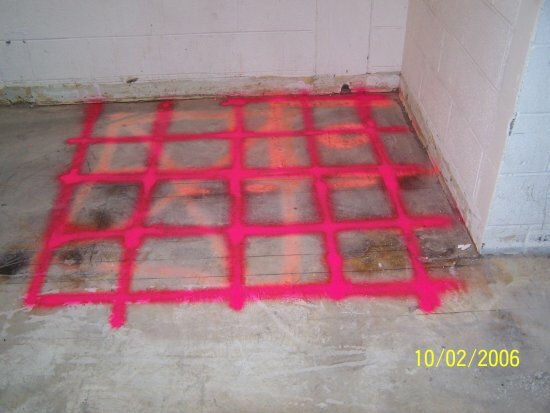 The pink paint marks depict the location of metal reinforcing contained in the slab. This allows the coring contractor to avoid cutting the metal and thus maintain the structural integrity of the slab. This wall was scanned using a 1GHz antenna. 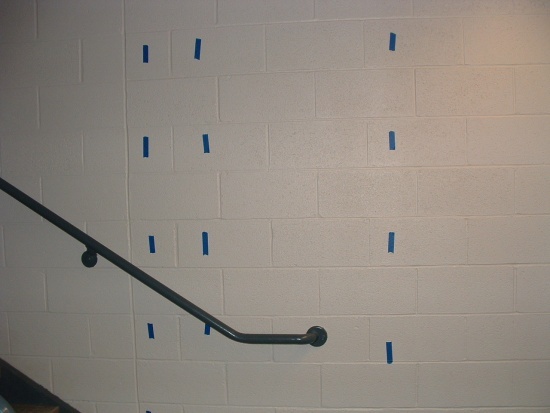 Blue tape was used to mark the position of the vertical metal reinforcing or lack there of.